New members are welcome as we explore the wisdom of this great little book by Ravi Zacharias. To get the most out of each meeting, you will want to download the study questions at rfcctx.com/study-questions. Or just click here. We meet from 11:00 to 12:30 each Tuesday and take turns tackling each of the discussion questions. One thing we guarantee is a lively discussion. Again, if you have not read the chapter and prepared the discussion questions, you are still more than welcome. While our discussions are tethered to Ravi’s book, you will be able to enjoy and learn without doing the recommended ‘homework’. 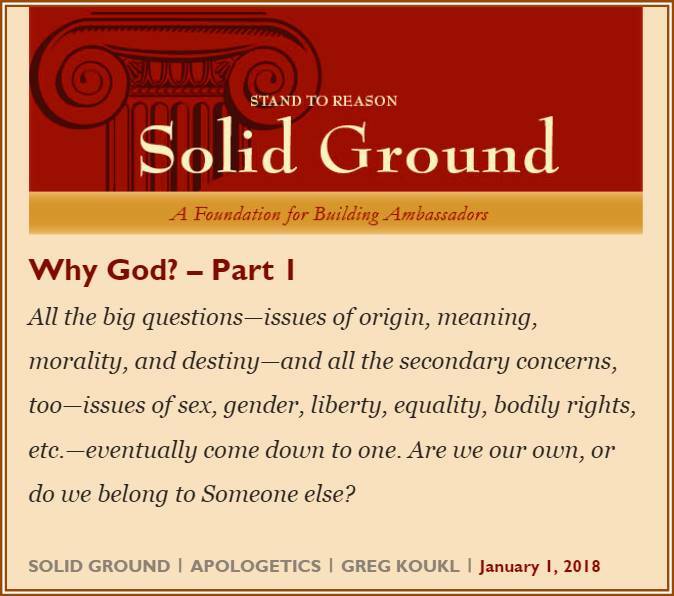 Greg Koukl’s latest “Solid Ground” article provides a solid but fresh perspective on the most basic issues we face today. Our Tuesday morning (11:00 AM) study group will be discussing this article this coming Tuesday. What is the purpose of Christian apologetics? If it is to bolster the confidence of believers and to equip believers to more effectively engage the culture, then you do not want to miss the “dawn patrol” Truth Talks class every Sunday morning. Stan Cole has been quietly leading a revolution for the Gospel and this is our opportunity to learn what this “three circles” thing is all about. One thing is certain. It’s not like anything you’ve ever done before. Stan will show us how to share the gospel with the world without having a nervous breakdown. It’s natural. It’s simple. It’s the right thing to do.